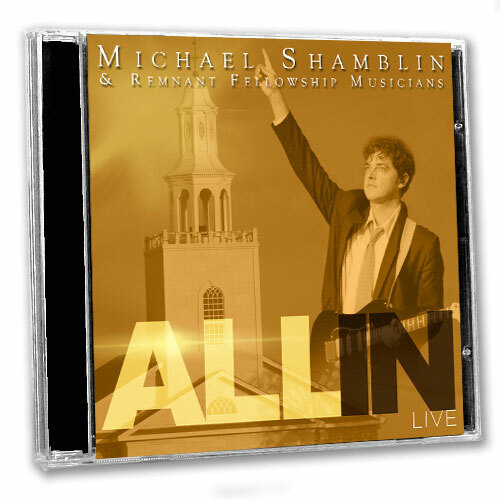 The All In Live CD features dynamic performances from Michael Shamblin, a worship leader and songwriter for Remnant Fellowship Church, along with various other songwriters and musicians at the Church. They’ve all experienced a transformation in their own lives, and they know that the power of God’s music to change your attitude and to heal is true. All of this Remnant music has been inspired by the Godly, life-changing teachings of Gwen Shamblin, the founder of Remnant Fellowship Church and Weigh Down Ministries. Gwen, Michael, and the Remnant musicians hope that this Concert CD is a blessing and encouragement to all who hear it. *Eternal Flame written by Billy Steinberg, Tom Kelly, Susanna Hoffs. Copyright 1988 Sony/ATV Tunes LLC, Songs of Universal, Inc.